Respected, experienced, dedicated. 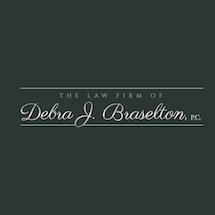 Attorney Debra J. Braselton practices family law exclusively and with excellence. The firm represents clients from DuPage, Kane and surrounding counties in the full range of family law matters including prenuptial and postnuptial agreements, uncontested dissolution of marriage, complex divorce, litigation, collaborative law, custody, child support, adoption and mediation. An attorney for nearly 20 years, Ms. Braselton also holds a masters degree in nursing and has a wealth of experience working with families. Ms. Braselton is an experienced Guardian ad Liter and Parenting Coordinator and is frequently appointed by judges to represent children in high conflict divorce matters and to represent elderly persons in guardianship cases. Ms. Braselton believes that family law issues impact the very core of our society - the family unit. She strives to minimize acrimony among family members while protecting the rights of her clients through zealous advocacy. The vast majority of Ms Braselton's cases settle before trial, a success rate she attributes to meticulous case preparation and dedication to achieving the best possible results for her clients. Ms. Braselton's background and experience have earned her widespread respect among her peers and, based on peer recommendations, she was selected for inclusion in 2012 Illinois Super Lawyers. All inquiries are held in strictest confidence. To schedule an initial consultation, call 630-DIVORCE (630-348-6723).